My latest makeover project is a little wooden window frame I picked up for $2.00. Dust, dried flowers and all. First thing I had to do was to tear out all the old dusty flowers and ribbons. And oh yea, the tons of glue that held on the styroafoam the dried flowers were stuck in. Second thing I did was to paint the entire window a flat black. Then I took some pieces of fabric and made a makeshift set of curtains on it. I simply stapled them in place on the back. 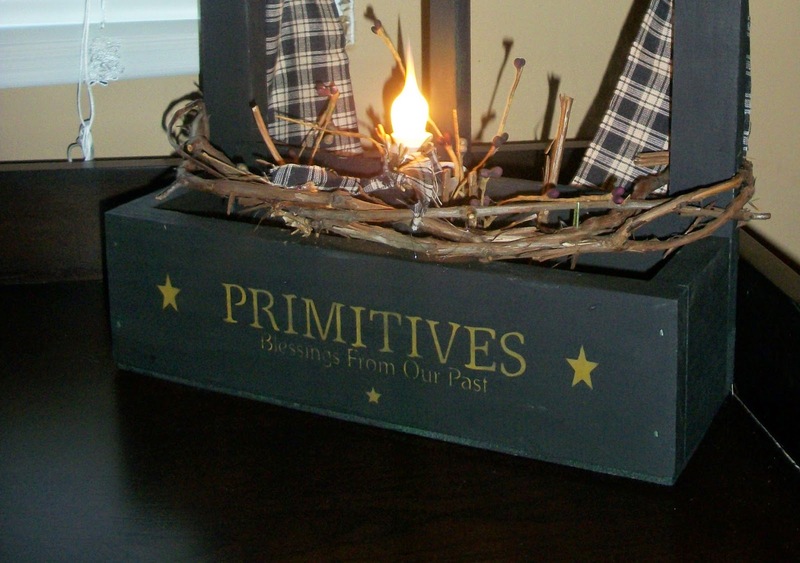 I also used a stenciled saying I got from eBay and put on the front that says, "Primitives Blessings from our Past. I just love that one and use it a lot. Then I put a little electric candle in it with a prim bulb and a bit of grapevine as decoration. That is so awesome! I love it! You did an excellent job too!